First, and foremost, I hope that everyone out there enjoys the blessings of our Lord and Savior today… whether you celebrate Christmas, or something else. As I monitor the news I have noted that the “Merry Christmas vs. Happy Holiday” wars continue to escalate. Recently, a store owner posted “Merry Christmas” on her store window, along with a picture of a manger scene. She received some scathing emails in return. Allow me to share my somewhat rare view on the matter. Here’s the thing. The heart of the matter, is a matter of the heart. You cannot force people to believe in God. The changes in our government and culture, (e.g., changing “Merry Christmas” to “Happy Holidays” or removing prayer from schools) are merely the symptoms of the core concern…. a turning away, by the people in this country as a whole, away from God. 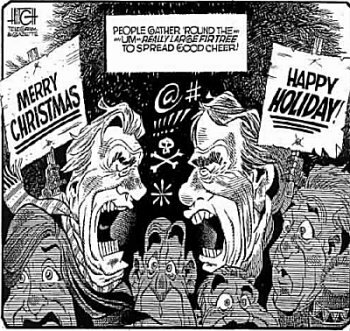 So, screaming the loudest and insisting people use and/or allow “Merry Christmas” instead of “Happy Holidays” will not solve the problem. Jesus, through his ministry, showed us that change come from inside, by walking with Christ in faith. He never encouraged His disciples to join government or protests in an effort to force cultural changes from the outside in. Now, don’t get me wrong. As an American, I believe in our rights of free speech. Private citizens should have the protected right to say “Merry Christmas” without fear of violence or anything along those lines. However, actions have consequences, and God calls us to act with the wisdom of serpents. Paul lived his live within the context of his culture that he might be all things to all people so that he might win some for the glory of God. It seems to me that by drawing this line in the sand we waste time and energy over a secondary matter by trying to force people to embrace our point of view. Again, this seems contrary to the spirit of Jesus’ message. We would do well do consider how we, as a country, got to this point in the first place. Now, my mother raised her boy to take responsibility. Which means, when I face a problem with multiple causes, like this, I should seek out any of those I can take responsibility for, first… and spend as little time as possible blaming others. That does not mean other factors did not play a role, nor does it mean that the problem would not benefit from others helping to fix the issue. However, if we waste time blaming each other, we do not solve the problem. Instead, each of us should take responsibility and moves forward, addressing anything within our power. Doing so, we cover a lot more distance. With that said, why have we, as a country, fallen so far away from God? And what should we, as believers, do about it? Brennan Manning said, “The greatest single cause of atheism in the world today is Christians: who acknowledge Jesus with their lips, walk out the door, and deny Him by their lifestyle. That is what an unbelieving world simply finds unbelievable.” As I mentioned in an earlier post, America (and most western cultures) began moving to a post modern style many decades ago. Yet, most churches and pepole of faith have changed slowly, if at all. They continue to show their faith with talking, use of logic and debates, rather than actions, relationships and stories. “These outsiders are making a clear comment that churches are not getting through on the two greatest commandments,” to love God and love your neighbor, said McConnell. 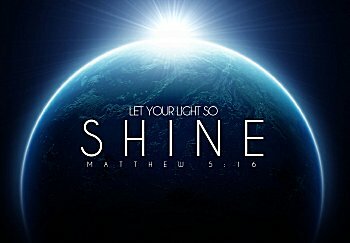 Jesus said “Let your light shine before men in such a way that they may see your good works, and glorify your Father who is in heaven.” Let those of us who want to see a Christian country, state, county or neighborhood…heck…even just our family… keep these things in mind and start with the man, or woman, in the mirror. If we want others to believe in Christ (and, by extension, the true meaning of Christmas), let us dedicate ourselves to living out His love and truth every, single day.